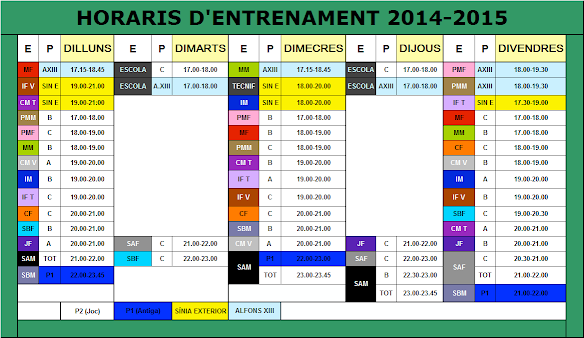 TENIM ENCARA TRES EQUIPS COMPETINT! DESPRÉS DE GUANYAR A PISTA DEL NOU BADIA I RECUPERAR EL FACTOR PISTA, EL SÈNIOR "B" MASCULÍ POT REMATAR LA FEINA I CERTIFICAR LA PERMANÈNCIA AQUEST DIUMENGE A LES 17:30h AL POLI. NO US HO PERDEU! EL SÈNIOR "B" FEMENÍ S'HA GUANYAT DESPRÉS DE LA SEVA EXCEL·LENT TEMPORADA DISPUTAR AQUESTA FASE FINAL DE TERCERA CATEGORIA "A" PROVINCIAL. EL RIVAL SERÀ L'AE SANT ANDREU DE NATZARET "B", A LES 20H A VIC! 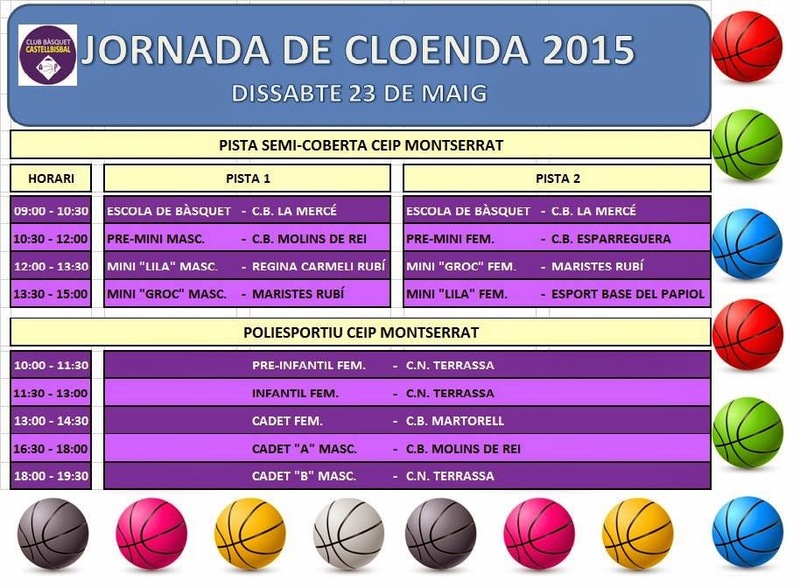 EL JÚNIOR FEMENÍ JUGARÀ DE LA MATEIXA MANERA LA FASE FINAL DE NIVELL A PROVINCIAL A SANT FRUTIÓS. 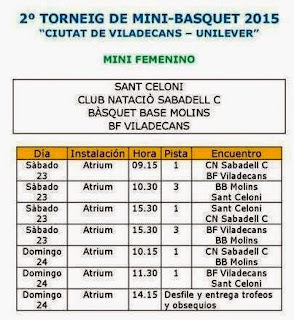 EL PRIMER RIVAL, DISSABTE A LES 9:15h, EL XAMBA DE VILAFRANCA. EL DISSABTE, EL CB CASTELLBISBAL CELEBRA LA SEVA JORNADA DE CLOENDA, AMB PARTICIPACIÓ DEL NOSTRE PRE-MINI MASCULÍ (10:30h) I DEL CADET MASCULÍ TARONJA (16:30h). 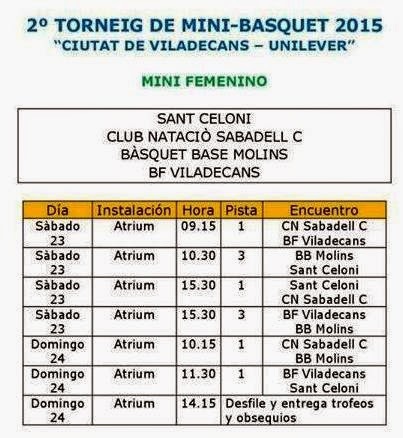 I A VILADECANS, EN EL 2n TORNEIG DE MINI-BASQUET 2015 "CIUTAT DE VILADECANS-UNILEVER, TENIM LA PARTICIPACIÓ DEL MINI FEMENÍ, QUE JUGARÀ TRES PARTITS: DISSABTE A LES 10:30h I A LES 15:30h I DIUMENGE A LES 10:15h.